It probably comes as no surprise, but I love to read! I read anything and everything I can get my hands on. I reread books like others re-watch movies, and half my time online is spent reading blog posts. In fact, I’m one of those weird people who prefers the articles over the podcasts and videos. Because reading is such a huge part of my life, I thought it might fun to start a new monthly feature where I share a few (not all) of the titles and posts I’ve read and enjoyed throughout the month. So, without further ado, welcome to What I’ve Been Reading-May Edition. Grab a cup of tea, coffee, or beverage of choice and come join me below. Before I jump to the good stuff I thought it might be prudent to share a few little details. First, I will always give my 100% honest opinion of what I’ve been reading. If it sucked, I’ll tell you! Please keep in mind that I’m not a professional book critic though, all I can do is give my personal opinion. There will not be a theme to each month. I don’t read in themes, at least not intentionally. We’re a family of readers, so don’t be surprised to see some kid books or recommendations from my husband or teen thrown into the mix. Now let’s get to the fun stuff shall we? One of my goals for this year is to grow more of our own vegetables and fruit when and where we can. One of my favourite summertime treat is fresh picked strawberries, but we only have so much garden room and we’re renting so it’s not like I can just go dig up the yard to plant some berries. Then I came across this great post from Garden Therapy about Growing Strawberries in Hanging Containers/Grow Bags and it got me thinking about all the creative ways to grow things when you can’t dig up your yard. I’m on the hunt for the perfect spot to hang my berry baskets. In addition to eating them freshly picked, I love freezing strawberries. They make a wonderful snack on a hot summer’s day and they also make fantastic smoothies. This post over on The Super Mommy Club, 12 Easy Smoothies Recipes that Make Great Breakfast Ideas for Kids, has a wonderful collection of recipes to choose from including a section for strawberry smoothies. Yum! Summer has been on mind a lot lately, especially with the school holiday coming up so I’ve been spending some time trying to gather ideas for fun stuff that Liam might like to do this summer. I didn’t have to look far. Brain Power Boy had a whole collection of Fun Activities for Boys. What I love most about these great ideas is that they are organized into wonderful categories that make hunting for something to do so easy. Sidewalk chalk is always a hit around our house, despite that fact that Liam is getting older. Colour Your Summer: Sidewalk Chalk for Kids from Child Led Life had some great ideas. Though Liam is a little old for some of the activities, the recipes for making our own sidewalk chalk are sure to come in handy. It’s two for one fun. First we get to make the chalk, then we get to create with it. How much fun is that? On the home front I’ve been working my way through our stuff room by room. Clutter has a tendency to sneak up on me at times. Though I’m careful about what we bring into our home, clutter still finds its way back. Reading The Hidden Cost of Clutter, over on Organizing Made Fun, was a great reminder that clutter sometimes comes with a price tag. It was just what I needed to motivate me to hunt out the clutter. Speaking of the home front, I’ve been trying to come up with ideas for how to decorate our home. I have bare walls and too small rugs all over the place. One of the biggest hold backs for me is that the last time I tried to decorate a room I ended up with a couch and loveseat that I can’t sit on for any length of time (hello headache!) and forget laying down on them, the arms are too high for comfort. I’m scared of making another bad choice, so I just don’t make any choices. This candid look at a room decorating challenge, One Room Challenge – The Reveal After the Reveal, from iHeart Organizing really spoke to me and I found the direction of my home decorating thoughts changing. The last link I want to share is one I read today! How’s that for up to the minute reading? Being perfectly honest here, this post made me sad and it made me angry. I’ve read almost every single title on this list of the 25 Most Banned Books of the Last 15 Years. Many of them are wonderful works of literature and all of them are great stories. The only I haven’t read is the last one, because 50 Shades just doesn’t appeal to me. What’s most troubling, is if you look at WHY some of these books have been banned it leaves you wondering how these schools, libraries and communities have any books left in them? With ebooks and e-libraries on the rise, banning a book is now pointless. Those who want to read them will find a way, just like we did back in the day. I read a ton of books each month. It’s normal for me to have two on the go at once, sometimes three or more depending on what I’m working on at the moment. One is always a fiction book. It’s a must in my world to have a good fiction book on the go at all times. Here’s a peek at my favourite fictions books this month. I have read this trilogy a number of times now, and I keep coming back to it. I have it in e-book format, and normally that doesn’t bother me but I’ve got this boxed set on my wishlist because these books are bury your nose in them kind of book. It’s one of those stories that begs you to curl up in your favourite reading spot with a cup of tea and lose track of the whole afternoon. Beautifully written with a story line that draws you in and pulls you along for the ride, and yet there are subtle intricacies sprinkled throughout the plot line that lend a richness to the story, add a dash of mystery and are a testament to the author’s fine attention to little details. Now, I’ve heard some people say this is just another version of Twilight. I’ve read the Twilight series – this is NOT Twilight. Sure there are some general similarities in the main plot, but these books are a whole different level. Whenever I am in the mood for a good adventure story I hunt down a book by Clive Cussler. I’ve only read his Dirk Pitt and Kurt Austin series, but my husband really like the Oregon Files and Issac Bells ones too. This time around was a Dirk Pitt adventure. I love these stories because they’re all save the world, action and adventure in their purest, fictional terms. I love them! Arctic Drift delves deep into the mysteries of the history of the North West Passage. I love how Cussler begins his book with a point some time in history and weaves his tale around that event. I also love that these stories are fun and pure fiction, as a good story should be. The character crack me up, they’re real and believable and a little bit out there at times. Think James Bond meets MacGuyver with a little Bruce Willis ala Die Hard thrown in. If you’re looking for fun, daring, and adventure you can’t go wrong with a book by Cussler. This one was another book that I’ve read before. You can read my thoughts right here in this post- 52 Reads Week 9 – The Chase. These two authors are a dynamite pair! I’ll spare you a second review, but I will say that I loved the book just as much this time as I did last time. The characters are fantastic, the plot is great, and again, this is pure fiction! I love it when authors don’t worry too much about keeping it all real and have fun with the world of fiction. My opinion is that we live in the real world, fictional books should take us out of the real world a little bit and add in a little mystery and leave us wondering just a bit. If you’re looking for a light yet thoroughly enjoyable read, this one is for you. For every fiction book I have on the go I have at least one, if not two or three, non-fiction books that I’m reading as well. Many of these are e-books written by fellow bloggers, or are on a subject I want or need to learn more about. There are, after all, only so many hours in a day and I can’t spend all of them reading. Though if anyone knows of a job that would pay me to read all day, I’ll gladly apply! 😉 It was hard to whittle these ones down, but again, I didn’t want to overwhelm you with the sheer number of titles, so I picked my top three, just like the fiction section. This book has been on my wishlist for a loooong time! So many of my fellow blogging friends have read it, loved it, and highly recommend it. It was included in the Ultimate Homemaking Bundle back in April, and I finally had a chance to curl up and see what I’d been missing. Boy, they weren’t wrong! It is a great book. If you’re a blogger, or thinking about starting blog, I recommend you add this one to your list of resource you want to invest in. Ruth walks you through ideas for monetizing, but also talks a lot about how to keep your integrity. How to be true to your voice, to your readers. For me, the hardest part of this blogging adventure has been monetizing this site. When I first started blogging, I never thought I’d still be at it, and on such a large scale, three years later. I also didn’t realize all the hidden costs associated with running a website. Things like hosting and domain name registration. Programs and apps that help make things like promoting a little easier. There are a bunch of different things and they start to really add up after a while. When you’re a family on a single income with a tight budget, at some point the expense grows to more than you can comfortably afford. If you’re like me, the thought of ad networks and affiliate programs is daunting, scary and a little off putting, but after reading this book I’ve come to the realization that it’s ok to find way to recoup those expenses and it’s even ok to earn a profit for the time and energy you put into to running a blog. Ruth shows you that it is possible for you to continue to blog for all the reasons you started; for all the reasons that keep you coming back to post more; to continue to pursue your passion; and make some money doing it without selling your soul. You can check out more great stuff on Ruth’s site Living Well Spending Less. When you’re knee deep in stuff and looking for something to help you figure out how to conquer the clutter, this is the book you want to read. Too many times organizing books or decluttering books can leave you feeling even more overwhelmed than when you were to start with, but not this one. Rachel does a brilliant job of getting to the heart of the matter in a concise manner that conveys enough information to put on the right path, without overwhelming you with the bloat that so many organizing books seem to have. She offers great advice for tackling different rooms as well as ideas for what to do with all the stuff you don’t need, and she has done an excellent job of avoiding repeating herself for the sake of making a longer book. This is one of the shortest e-books about organizing that I’ve ever read, and I loved that about it. The reading of the book does not take longer than following the suggestions in the book. Let’s face it, when we’re ready to get organized or start decluttering, the last thing we need is a book that takes us ages to read, we want something that will help us act quickly while that motivation is still there. This one tops my list of must have books in the Organizing category. I will be going back to it many times in the future when I need that push to tackle our clutter. If you’re looking for more great ideas checkout Rachel’s site Efficient Momma. Every once in a while I come across a book that I absolutely fall in love with. Often times it’s a series, sometimes it’s an author- but always they’re fiction. They are the books I will pick up again and again when I need comfort, when I’m stressed, when I need a little laugh. NEVER have I fallen in love with a non-fiction book – until now! This book launched last week, and no word of a lie, I am on my THIRD reading of it. Oh yes, you read that right, I’m reading it for the third time and I’ve only had it in my hands for a week and a half. Many times when I read a non-fiction book, especially one about a subject so near and dear to my heart like time management is (yes I know I’m weird! lol) I read it with a note book and pen by my side because I know I’m going to be taking notes, and this one was no exception. However, part way through chapter three I realized that I was going to be reading this book a second time because I was having too much fun reading to take notes. You see the book is written by Moms for Moms, (though even if you are not a mom I still think you will find a ton of great information in this book) and it is written as though the author’s are having a conversation with you. In fact, that’s exactly how it feels when I’m reading it, like I’m sitting down having a chat with a friend. So I read it cover to cover in one sitting. I couldn’t put it down, not even to cook dinner. I cooked dinner, but I was reading whenever I had a moment. After the first reading, I went through it again over the next couple of days. Taking the time to think over what I was reading and make some notes. I went and downloaded the helpful printables that are included with your purchase of the book, and then I let it be for a few days. I picked it back up on Wednesday and am slowly working my way through each chapter following the Take Away steps and slowly working on finding the right balance between my personal and professional lives. Because that is what is at the heart of this book-working towards striking a balance between work and personal. It’s one of the BEST time management books I’ve ever read, and I’ve read a ton of them. This is not your typical, written by a business guru for other business people, time management. This is real world, juggling motherhood and our chosen profession, time management. It’s real women talking about what’s worked for them, why it’s worked, and how you can carve out your own path. They don’t promise to help you do it all, in fact they tell you early on that you can’t do it all, at least not all at once. Sarah and Beth Anne cover everything from determining what is most important to you right now, to goal setting, to habit building. They show you how to create the system and choose the goals that work for you and as you all know I think that’s pretty fantastic. They’ve taken a complex topic and boiled it down to what matters most, then presented in a way that leaves you feeling empowered and encouraged and ready to take on the world, or at least your own world. In my opinion, if you’re only going to invest in one time management book, THIS is the one you want! Check out more great stuff from these gals and take peek at their new planner over on their site Brilliant Business Moms! So those are a few of the things I’ve been reading this month. I had no real system for choosing which ones to share, though the ones I enjoyed most made the list. I wanted to include some that I didn’t like to balance things out, but I haven’t read anything this month that I thought was horrible, to be honest, I have a hard time not finding something to like about what I’m reading. I know how much time, effort and work goes into writing a book or even a simple blog post, so I always try to find the good, but I will most definitely share the bad with you as well. It just so happened that this month I read all good stuff. I love it when I have a month like that! 🙂 If you have read any of the books I shared I would love to hear your thoughts on them! Now it’s your turn to share – what have you been reading? Anything you recommend I add to my reading list? On to your other selections. I love this post. It is a lot of fun to take a peak at someone else’s bookshelf. We have different reading tastes in fiction – interesting. I used to read mysteries but can’t really do it now. However I did really enjoy the How to Blog for Profit book and agree that it is worth a purchase and is a good read. I am looking forward to next month’s post! Lol May was a rather light month fiction wise for me. I’ve been reading so many technical books and articles that I opted for light and fun in the fiction department. I usually try for a more rounded reading selection. What sort of fiction books do you enjoy? Thank you so much for putting together such a great collection of activities. It makes finding something new to do an easy undertaking. Liam loves your site, according to him you have the best stuff. Pirates are a particular favourite right now. You must read all of Clive Cussler books starting with his very first Dirk Pitt. Many years ago my mom gave me a set (just because she thought I would like them) and for many years I didn’t touch them. One day out of boredom, I grab the first one and haven’t put one down since – it’s been about 35 years now (right after my first husband and I married). My current husband and I met because of a Clive Cussler book (19 years ago)! Thank you so much for adding our Color Your Summer post. It is wonderful to have you on Child Led Life! Also, I’m VERY jealous of your reading time. 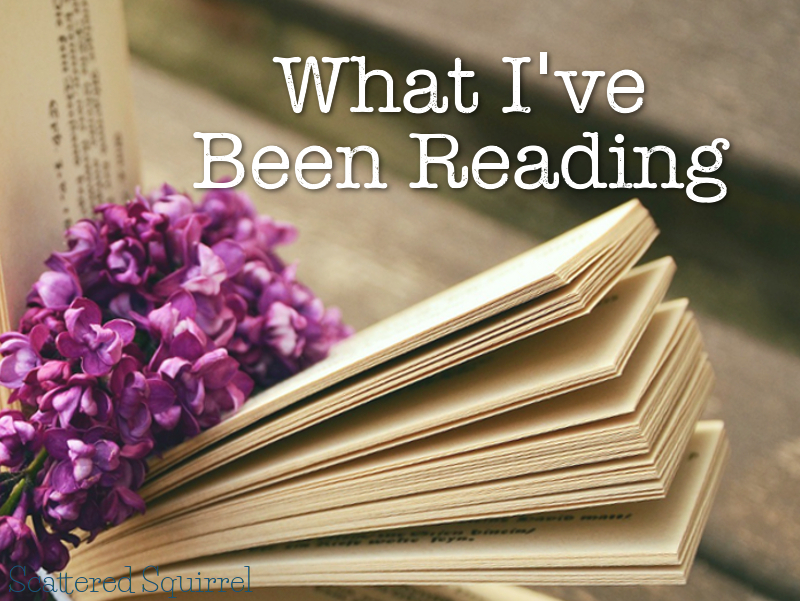 Oh my – you have read all of that in May?? I’m green with envy! I was just looking through the banned books – I read Of Mice and Men at school – and I just discovered To Kill a Mockingbird a few years back and thought that I ‘should’ have read that one at school . And how on earth can anyone ban Harry Potter??? I do have to say that I really didn’t like Catcher in the Rye – though I can’t for the life of me remember why now. My recommendation is A Tap on the Window by Linwood Barclay – a previous occupant of our holiday home had left it and I read it last week – from cover to cover in a day and a bit – couldn’t put it down once I started! p.s. thank you so much for including my Smoothie post in the mix. Lol – nope I didn’t read all that in May, that’s just some of it. I’m a voracious reader. I’m lost without having a couple of books on the go at any given time, though June is shaping up to be a lighter reading month for me as I’m working on a couple of new projects that are sucking up all my time. Censorship is worrying. I believe we should all be able to choose for ourselves what we read. Books challenge us to think in new ways, expose us to new ideas, introduce us to wonderful new worlds, allow us to walk in someone else shoes, and at the end of day, either they help change our way of thinking or they reinforce our way of thinking. Denying people the opportunity to read certain book and form their own opinions is just wrong in my book. Just finished my first read of Time Management Mama and I have to agree that I knew I’d be going back and re-reading this one! One of the best time management books I’ve read and it has already changed the way I structure my time as a work-from-home mama. Great recommendation! It really was fabulous wasn’t it? I don’t think I’ve ever recommended a book to so many friends and family members as I have this one. I’ve been implementing the steps bit by bit and am feeling much more in control of time, rather than always feeling like I was running out of it.